Home » James E. Babcock, Jr.
JAMES E. BABCOCK, JR. is an associate attorney at GWC. 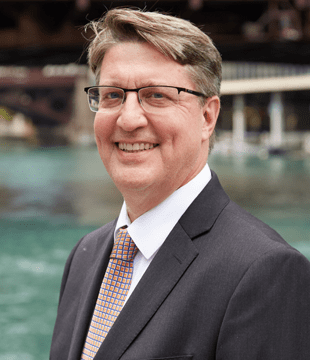 Raised in Joliet with a family background in law, Jim joined the Will County State’s Attorney’s Office upon graduating from DePaul University College of Law in 1986. He subsequently entered private practice, where he litigated complex injury cases and Illinois workers’ compensation claims. Over thirty years, Jim obtained verdicts, settlements, and awards in excess of $1,000,000 for individual personal injury clients and workers’ compensation settlements in excess of $375,000.00. In evaluations by his peers and the judges before whom he appeared, Jim was praised as being exceptionally hard working and well prepared. With that experience as a litigator, Jim joined GWC in 2016, where he has focused upon workers’ compensation cases and efficiently maximizing client recoveries with the aid of technology. He is a member of the Illinois State Bar Association and the Workers’ Compensation Lawyers Association. When not practicing law, Jim spends time with his grown family of four, coaches youth basketball, and serves as a mentor and judge for youth moot court competitions.